A few months ago I was invited to give an address to a local photographic arts group. I titled my talk “The Urge to Create,” in the course of which I had emphatically dismissed the idea of “rules” in the creation of art. At the end of the meeting, a gentleman asked one of the very good questions that were posed that evening: "If there are no rules, then how do we maintain standards?" As a fuller discussion of this could easily have absorbed another several hours, I thought it best to postpone, and then promptly forgot about this interesting problem. Recently, thinking about other matters that I plan to write about, that question came to mind again, and so I thought I'd explore it further and publicly offer a brief reply. Rules and standards are not synonymous. "Standards" refers to the quality of rendition or realization with which artists seek to convey their thoughts. These necessarily differ from artist to artist, and medium to medium, yet offer a basis of comparison to a learned, sophisticated and empathetic audience. "Rules" are of a different nature, because they so clearly imply that there is the presence of some form of ruler, perhaps of an aesthetic legislature. This is certainly the most completely dysfunctional aspect of the creative process, because creating by rule leads only to a kind of metaphysical, intellectual uniformity, which is a polite term for utterly "safe," and therefore utterly boring. It is the antithesis of creativity. One of the best examples of this is the rigidity with which the Salon (Académie des Beaux-Arts) of the mid-nineteenth century chose those paintings that "deserved" exhibition. In 1863, Napoleon III, responding to a huge furor, established the Salon des Refusés, which showed many of the works that had been refused entry by the official Salon. This was repeated in 1874, 1875 and 1876, by which time the official Salon came to be regarded as rigid and rule-bound, and the modern art of France, including the once officially dismissed "Impressionists," began to achieve the wonder it deserves so well. How many of the painters of the Académie can one remember, even the very prominent and successful Jean-Louis-Ernest Meissonier, painter of Napoleon, as opposed to the names of Manet, Monet, Cézanne, Degas, Pissarro, Sisley, Dutch-born van Gogh, and others? I've selected four works, two paintings and two photographs, to illustrate my point: Sir Anthony van Dyck's 1614 The Apostle Simon; Eugène Atget's 1921 photograph Rue de l'Hôtel-de-Ville; Salvador Dali's 1931 The Persistence of Memory; and my own recent digital photograph, Cobalt Explorer. So let's see. Where are the "rules"? 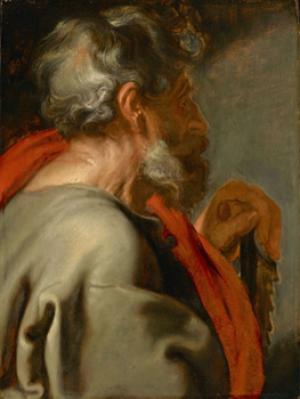 Van Dyck's portrait intrigues precisely because the subject's back is partially turned toward us. The colors are muted, as is the shape of his face, and this requires time, engagement and intelligence from the viewer. No catchlights in the eyes! Indeed, only one eye in profile. Yet the standards by which the work can be judged are superb. Simon looks his part. More than that, he acts his part. Only the heartless could deny him. 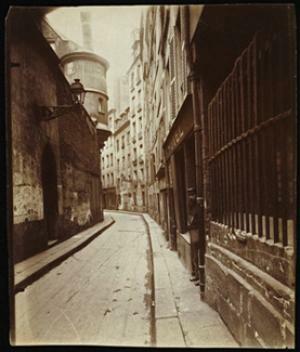 Atget gave us wonderful images of "vieux Paris," before demolition and modern reconstruction occurred. They are documents of a city that has now changed so much, and we owe to Berenice Abbott the fact that they were preserved after his death. Here is a street, the "street of the City Hall," made shortly after dawn, without humans, but conveying a deep sense of time and place. Where are the "rules?" Look more deeply into his photographs, and the standards become so much more obvious. Thank goodness he paid no attention to imposed "rules." 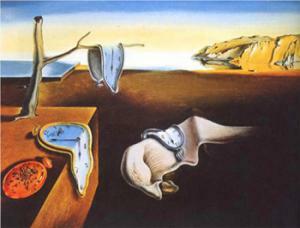 Look carefully at Salvador Dali's work. Are there really "rules" to guide us on the depiction of time and memory? Is there a "rule" that clocks can't be flexibly draped over branches and other objects? Does this conform to creative standards? Does it free the mind of the viewer from expectation, and instead induce surprise and wonder? What about Cobalt Explorer? Aren't there "rules" about not having part of a blue human foot intruding into the field from the bottom right corner? I'm sure there must be. But, is there a narrative? Can one imagine a story? I hope so. So much of art demands audience intelligence. If it is so true of literature, music and architecture, then why not of paintings and photographs? 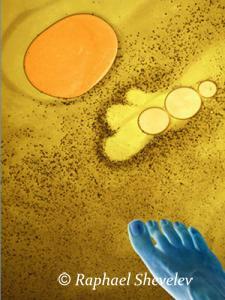 “The magic synthesis” is what Arthur Koestler called the relationship between artist and viewer. Nevertheless, in the half-century since Breton’s death, Surrealism and many other forms of modern art continue to encourage liberation from constraints, from imposed logic, rules and expectation, and therefore have a great deal in common with wit and humor. Recently, a photographer friend, Mary De Shaw, sent me one of her images that had been subjected to what I regard as very silly notions of compositional "rules." 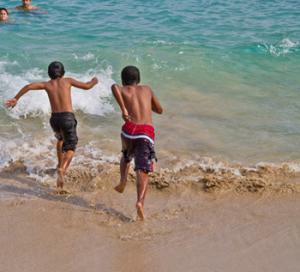 She was told by a competition judge to remove the heads in the upper left, much of the ocean on the right of the image, and center on the two boys splashing in the surf. However, isn’t there a powerful parallel narrative of how the ocean can offer experiences of immense energy and immense lassitude? Both are present here in intriguing ways. This image also offers a metaphor for the oceans between which the United States is located. It's almost as though the artist had been looking across the country from the turbulence of the Atlantic out beyond California, to the calm of the Pacific (hence its name). When I looked at this picture I was reminded of two books published 50 years apart: James Mitchener's Hawaii, and Simon Winchester's Atlantic. Of course, those trained to "judge" by the standards of much photographic instruction and many photographic associations would very likely have missed these ideas altogether, and enforced the mind-numbing "rules" of the composition police. My readers know that my least favorite word is “orthodox.” Creation and innovation require a conspiracy against rules. But keep in mind that there are also no rules for committing unorthodoxy. Imposing rules on art eviscerates art. NOTE: I am grateful to the Open Content Program of the Getty Museum for the downloads of the van Dyck and Atget images, and to Mary De Shaw for hers. Love the artistic selections you chose to illustrate your view. All compelling works. You are so smart and you have great aesthetic taste and skill. I was just reading your recent piece on rules in art, and it struck a chord. In the course of my researches into the life and work of Genevieve Taggard, I've been looking at her relationship with Robert Frost, and I found on the internet an abstract of a letter to her in about 1933, where he advises her not to let "the principles on which things are done" bother her, but rather "bother the principles." Empty rules - dogma, or principles for the sake of principles - are anathema to art, but there always seems in the greatest art to be a strong and flexible structure of some kind.